It is a common misconception that if you experience a hearing loss, it’s enough to use just one hearing aid. Though in the case of single-sided hearing loss this may be fine, most cases of hearing loss are bilateral, meaning hearing loss that affects both sides. Using just one hearing aid to treat bilateral hearing loss would be similar to getting a monocle when both of your eyes need glasses. 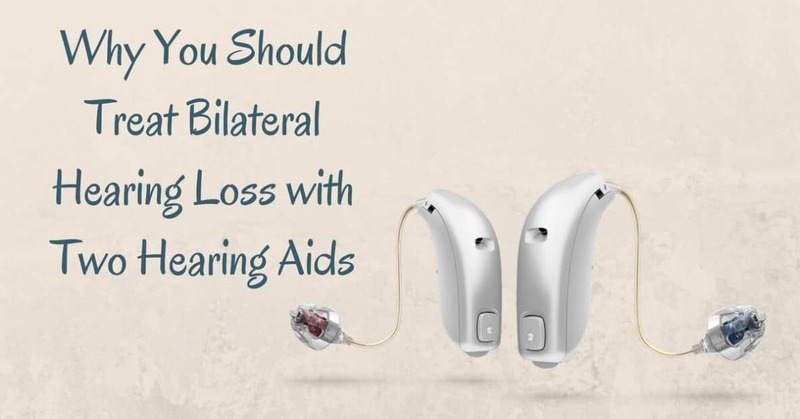 Though each ear may be affected by different degrees of hearing loss, it is still important to treat bilateral hearing loss with two hearing aids. We have two ears for a reason. Our sense of hearing helps us take in information from the world around us and helps us stay safe and make decisions. Hearing has developed over the course of human evolution to keep us safe. As such, the sense of hearing is never shut off – we’re able to wake up from a deep slumber from a simple alarm clock. When people experience hearing loss, it is commonly bilateral hearing loss – affecting both ears. Though it may seem like a good idea to cut costs and boost just one side, using just one hearing aid to treat bilateral hearing loss is actually not very useful. It’d be comparable to using mono rather than stereo speakers to listen to music. Sounds are not as detailed or as rich – and when it comes to our cognitive abilities, this could cause a strain. As such, if you’ve been diagnosed with bilateral hearing loss, consider the significant benefits of using two hearing aids. For people with hearing loss, the common complaint is, “I can hear, but I can’t understand.” With hearing loss, you might recall what it’s like to be in a conversation where it sounds like people are mumbling or muttering. In noisy environments, it may become difficult to differentiate speech sounds from background noise. With two hearing aids, sound information from 360-degrees of your environment are picked up and mixed, giving you access to speech sounds in front, to the side, and behind you. This provides a much more natural experience with speech recognition. Most advanced hearing aids are designed to share information with one another, mixing speech sounds from your environment. If you have a bilateral hearing loss, it is crucial to use two hearing aids to experience the full power of speech recognition. Our sense of hearing helps us locate ourselves within our environment – something you may not necessarily even notice until you begin to experience changes in your hearing. But if you consider this for a moment, you’ll see how obvious it is: if your friend is calling to you, you can tell by how loud it is whether your friend is across the street or right behind you. With hearing loss, it becomes difficult for people to identify distances between sounds, or to hear sounds coming from certain directions. With advanced levels of hearing loss, this could pose a security risk for people, especially if they are out and about in traffic or busy spaces. It may be difficult to recognize that a car is honking at you or that an emergency vehicle siren is directly behind you. If you experience bilateral hearing loss and use just one hearing aid, you’re only experiencing ½ of the sound in your environment. Using two hearing aids drastically improves your spatial reasoning and the directionality of sound within your environment, opening up 360-degrees of your environment, rather than just a 180-degree picture of your soundscape. Using two hearing aids to treat bilateral hearing loss keeps you safe and aware. While less common, there are cases of unilateral hearing loss, or single-sided hearing loss. Potential causes of single-sided hearing loss may include sudden deafness, birth defect, tumors of the auditory nerve, head injury, or diseases. The degree of unilateral hearing loss may range from severe to profound in just one ear. Single-sided hearing loss may cause difficulty understanding speech from the hard-of-hearing ear side, especially in a noisy room, and the impaired ability to tell the direction a sound is coming from. Single-sided hearing loss is treated with CROS or Bi-CROS hearing aids. At HeaRite Audiological Care, we offer comprehensive hearing tests and hearing aid fittings. If you believe you are experiencing changes in your hearing, take the first step to better hearing health and schedule a hearing test today.